Remember my very first attempt at loom knitting? 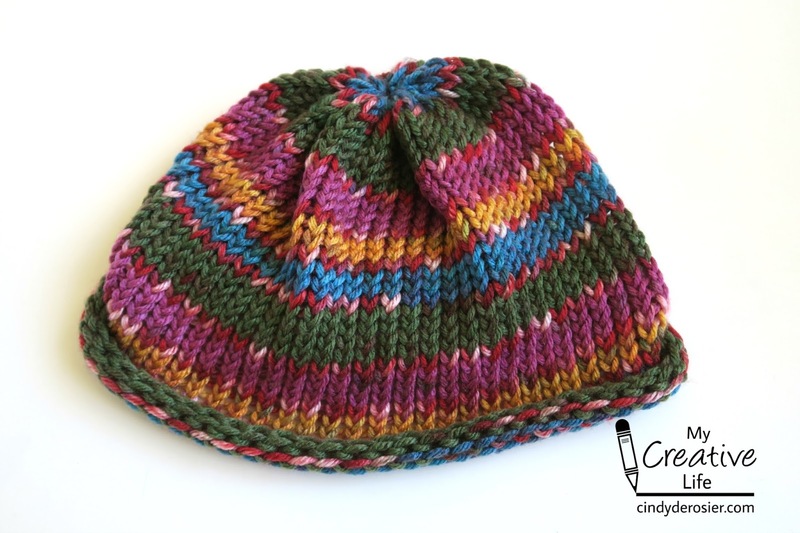 Here's my second project, a kid-size beanie using Deborah Norville Everyday Soft Worsted Yarn. This hat was made with a single skein of yarn. I've always called this type of yarn 'color-changing' but apparently the correct term is 'self-striping.' Either way, it's so cool! This shade is called Parrot. Like the previous beanie, I made this using the Oval Loom Knitting Set by Leisure Arts. This time I used the smaller of the two ovals to make a kid-sized beanie. It was ridiculously easy to do. In fact, I started it at one of Trevor's friend's birthday party on a Friday night, and finished it the next day at another friend's birthday party! The project is easy enough that I could mindlessly knit while chatting with the other parents. Amazing, since it's only my second project ever. It's a little too small for Trevor to model, and I haven't seen my niece (the intended recipient) since completing it. So you'll just have to imagine how it looks on an adorable 3-year old. I still have half of the skein of yarn left, so I'm strongly considering making her a matching scarf, or possibly a mini beanie for her doll. Thanks to Leisure Arts and Premier Yarn for providing me with the materials to make this project! Ohhhhhhhhh that is gorgeous! LOVING the colors!!!!!!!!!!!!!!! !